Apple’s freshly completed spaceship campus was the final project of Steve Jobs, and its construction came with the exacting demands that he was known for. Jobs wanted Apple’s employees to smoothly move through the headquarters without having to take a minute away from thinking about their work. The execution has reportedly gone so well that engineers are running right into the state-of-the-art glass that shapes the building. Is this a really big deal? Are people getting injured because Apple’s ambitions to have a campus that’s practically invisible have been executed too well? An Apple spokesperson declined to comment, but a representative for the Occupational Safety and Health Administration in Silicon Valley directed Bloomberg to its website to check on reports of injuries. No records were found. 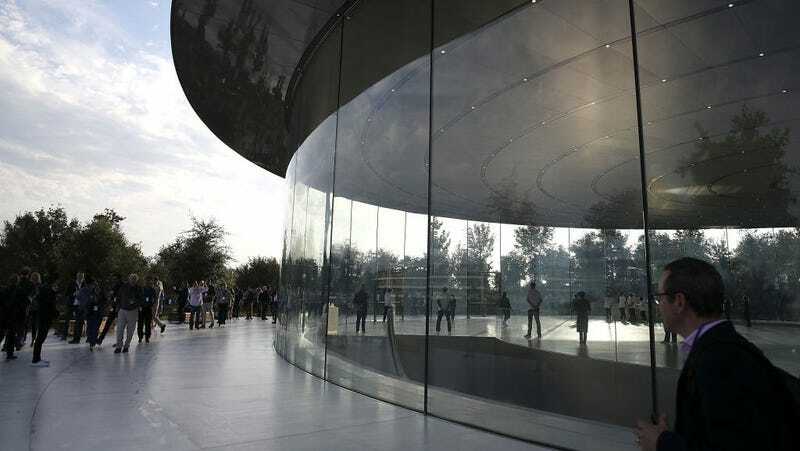 It’s hard to imagine a more metaphor-packed scenario than Apple’s products distracting its employees as they weave through a perfectly designed office and bang their faces into glass walls. The detail about the Post-it notes probably would’ve made Jobs smile. This was the guy who told users who were having antenna problems with the iPhone 4 that they should just adjust the way they hold it. No bodily injuries could justify a goddamn Post-it note on his glass. “The things you can’t see, they all mattered to Apple,” the former construction manager said. One of the most vexing features was the doorways, which Apple wanted to be perfectly flat, with no threshold. The construction team pushed back, but Apple held firm. The rationale? If engineers had to adjust their gait while entering the building, they risked distraction from their work, according to a former construction manager. “We spent months trying not to do that because that’s time, money and stuff that’s never been done before,” the former construction manager said. It seems that Apple really did have its workers in mind every step of the way, but there was one thing you can’t see that it didn’t take into account.